Is there anything Beyoncé can’t do? The answer, if you didn’t get it, is no, absolutely not. Beyoncé can sing. Beyoncé can act. Beyoncé can dance. And Beyoncé can perform at the 2016 CMA Awards. Know how I know? Because she totally did, and it was amazing! I would have never have expected the Queen of Pop to make the jump to the country stage, but the 2016 CMAs were already set to be a big night in country music — it’s the 50th anniversary of the ceremonies (they started in 1967), and the CMAs teased to expect the unexpected. Of course, I thought this meant that Dolly Parton would do some big performance or Reba McEntire or Willie Nelson or Vince Gill — you know, the big-time country stars — would surprise the audiences at the Bridgestone Arena and at home with appearances. Dolly Parton was there to receive the Willie Nelson Lifetime Achievement Award, and I’m a disciple of Dollywood, so I was already excited. But Beyoncé? I almost had to get my smelling salts when she came out on stage with the Dixie Chicks for an amazing rendition of "Daddy Lessons". Does this mean that Beyoncé's next album will be primed for country radio? Is she making a genre switch? What is happening in the world? Of course, Beyoncé isn't the first pop star to perform at the CMA Awards — Justin Timberlake took the stage with Chris Stapleton last year and, you know, Taylor Swift exists — but damn if Beyoncé isn't the greatest. You can see part of her performance below. And greatest she was, performing her Lemonade song with the Dixie Chicks. I don't really know what to say about it except that it was awesome. I loved every minute of it. I danced on my couch at home, and everyone in the audience at the 2016 CMAs danced in their seats. 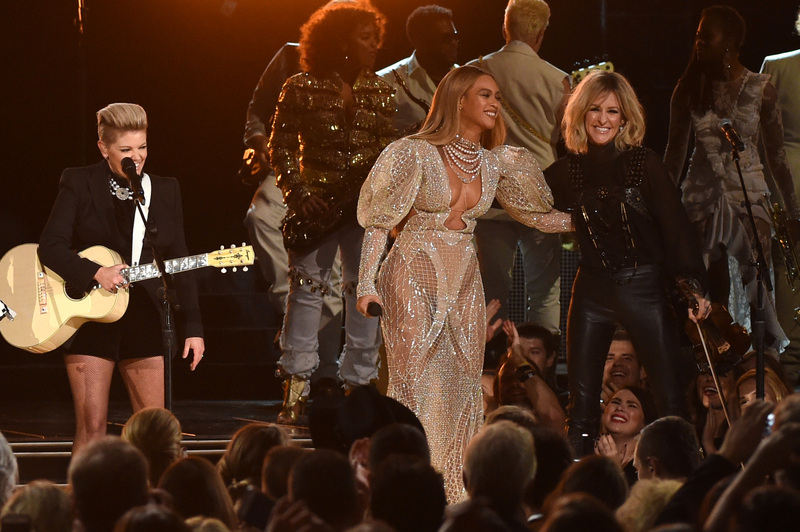 This makes a lot of sense that Bey and the Chicks teamed up on this — Dixie Chicks performed a cover of "Daddy Lessons" at one of their shows earlier in 2016, so I'm sure Beyoncé wanted in on the country music action. I mean, she is from Texas! She grew up with country music, and I'm so glad she put her own spin on the 2016 CMAs stage.